There are some cakes which can only be made for special occasions – this is definitely one of them! Rich, decadent and just a little bit over the top, this is birthday cake with attitude. 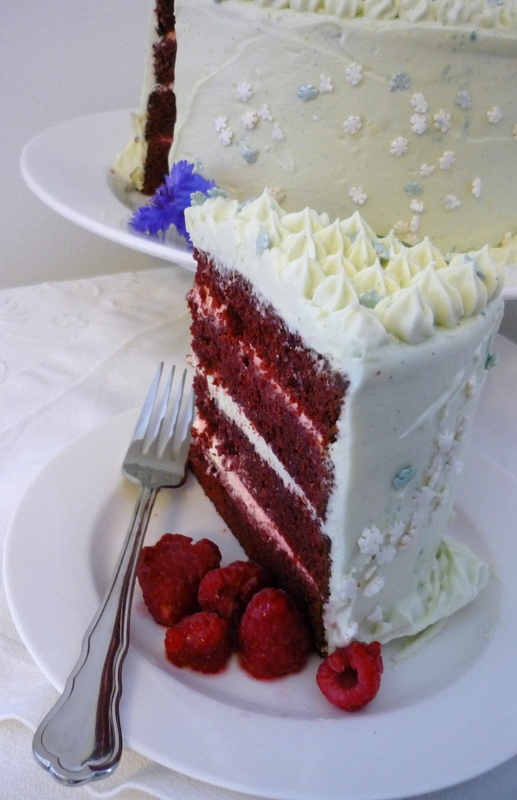 Red Velvet Cake has a long and in some cases dubious history in America, yet the quintessential flavour has always been somewhere between chocolate and vanilla – with the Velvet referring to nothing more than the silky smooth texture of the cake crumb... but just why is it red? The history of this cake (circa Victorian Era New York) points to the use of unrefined cocoa combined with baking soda and vinegar to get a deep russet red cake with a light and airy crumb. Although that sounds all very good and romantic 'red' does not have that much flavour and I would much prefer to make a cake that not only looks beautiful (think crimson alizarin oil paint) but has a discernable flavour. For this recipe I have fused a stripped down, less sweet version of the original recipe with a few more modern ingredients to enhance the flavour, not just the appearance. In the cake pictured I used freeze-dried raspberry powder and organic-based food dyes to achieve the colour, if you really want red, just use food colouring, if the idea is a bit off-putting, just bake it without the colouring for a natural mauvey/pink hue. I also love vanilla, so there is a generous portion of vanilla in this cake to give it it's musky sweetness. To make the raspberry purée take 1 ½ cups of whole, ripe raspberries (frozen is fine) and blitz with a blender until they are totally smooth. Pass the raspberry purée through a fine sieve, ensuring there are no seeds in the purée. Once smooth, add the buttermilk to the raspberries and mix well. Add the purée to the cake mix, then fold in the flour. Once the flour is combined, add the food colouring ensuring it is mixed through evenly. 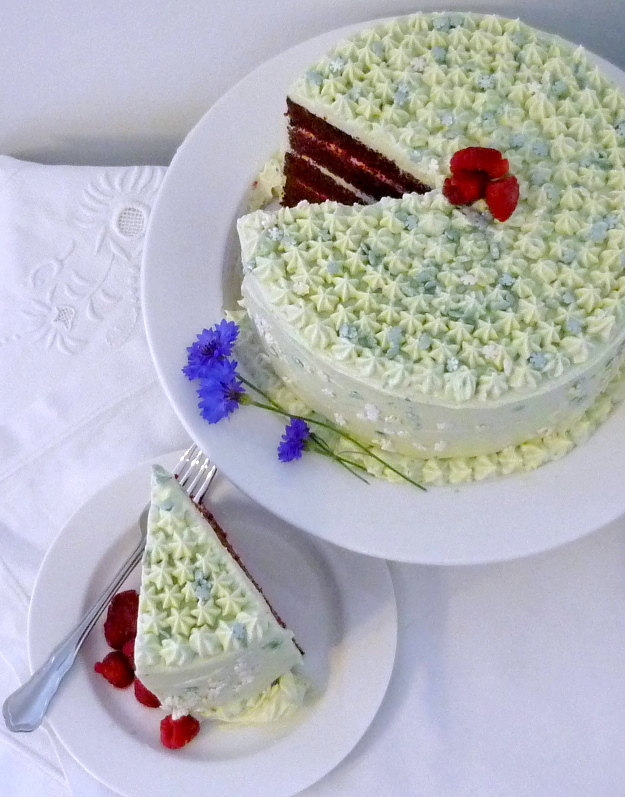 There is some debate about the "correct" icing for a Red Velvet cake. In my view, make whichever icing is going to make you smile the most and please as many of your family as possible. For the record, the cakes pictured are iced with white chocolate cheesecake icing.... but next time I think I may try old fashioned butter icing as the cheesecake icing is very rich! For these cakes I used a very pale opalescent food colouring powder (edible glitter) which made the red of the cake look even more ruby-like, I then topped it with tiny pearl-white and opalescent snowflakes. This is entirely over the top and unnecessary, but I was in the mood. 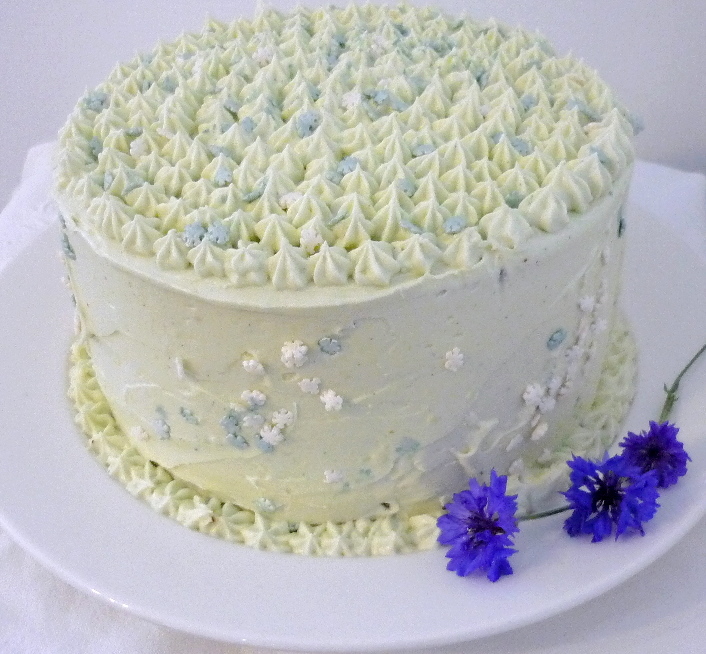 If desired, this icing can be tinted any colour you like! Serve with additional raspberry couli made from a cup of puréed raspberries, a tablespoon of raspberry liqueur or vanilla extract, a pinch of salt and a teaspoon of raspberry vinegar to knock back the sweetness. There is also a Blueberry Velvet Cake recipe here on thecookingbug.com just as rich and delicious, made with blueberries!